A year ago, the whirlwind tour with my family and in-laws that surrounded our wedding was winding down. From the 22 or so people who attended our cozy cabin in the Smokies, there were only 4 left: me, my wife Christine, my sister-in-law Jane, and Jane’s boyfriend Christoffer. 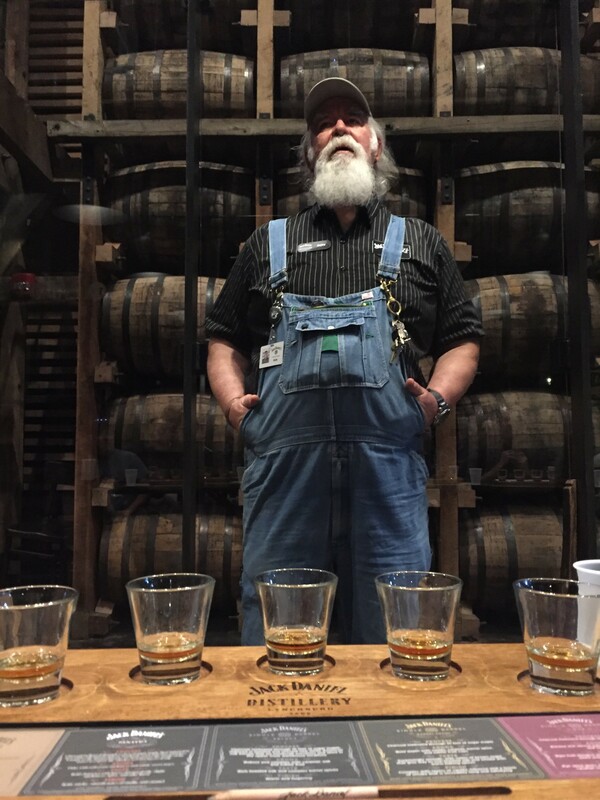 We decided the trip to Tennessee needed a bold, smoky finish, and we made our way from the ancient mountains of East Tennessee to the rolling hills of Middle Tennessee to the Jack Daniel’s Distillery in middle-of-nowhere Lynchburg. Despite my status as a near-native Tennessean, the pilgrimage to the world-famous whiskey maker was a first. And what a trip it was! Our guide, Ron, was a native with a deep but cheerful drawl, and spoke with pride and authority about the whiskey that made Lynchburg famous. Jack Daniels is often maligned by whisk(e)y snobs, and for understandable reasons. Anything that is mass-produced, relatively cheap, and as globally ubiquitous as Jack is likely to have its detractors. However, the care for the product–not just from Ron, but from the company as a whole–left us with a positive feeling for the whiskey that is far more often served with coke than by its lonesome. I mean, could we even ask for a better guide? Toward the end of the tour, our friend Ron started bragging about the casks made by Jack Daniels, “All them fancy folks in Scotland use our barrels!” It was around this point (or perhaps slightly later after a bit of Tennessee Whiskey) when someone in our group thought it would be a good idea to test this bold claim at some point down the road. Fast forward a year and a bit later, and the four of us reunited for a trip to Scotland. 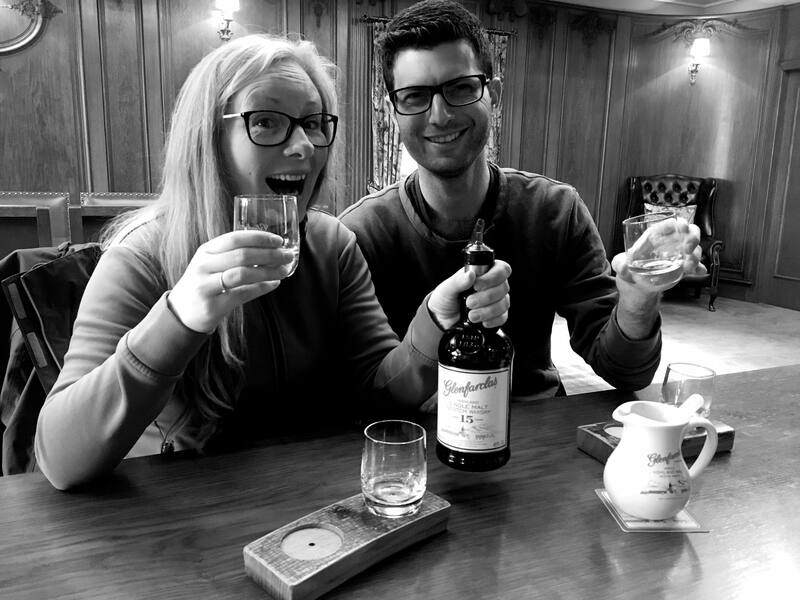 After a night out in Edinburgh (highly recommended), we got up early the next to drag our stuff to the car rental company, and then set off for the Speyside region, the area with the most distilleries per square mile in the world. I had been mentally preparing myself for driving on the other side of the road since our arrival, but nothing can fully prepare you for climbing into “the wrong side” of the car, putting the car into gear with your other hand, and heading out. If driving “normally” becomes second nature, simply switching sides is a big ask. I had to consciously think about every little thing, whether it was checking the mirrors (why is my left-side mirror so far away?! ), using my turn signal (why is this the same when everything else is reversed?! ), or even staying in my lane (I’m not used to seeing the world from this perspective)! And then there was the whole changing gears part. Now, I’m not a typical American insofar as I can drive a manual (thanks mom! ), but I absolutely could not get the feel for changing gears with my left hand. I stalled the car. A lot. I kept on accidentally shifting from 1st gear to 4th, killing the engine, infuriating the driver behind me, and repeating. I must have done this at least five times on the way out of Edinburgh. For my wife, who had promised not to criticize my driving, this was enough to prompt a nagging remark. Or maybe several. Eventually I got the hang of it, and soon enough the crowded and nerve-wracking city streets opened up on to the motorway, and eventually open country roads. And even more eventually, windy, far-too-narrow roads. Regardless, we all made it in one piece. Our home in Speyside was a small mobile home set up next to The Croft Inn. The inn, about a mile from Glenlivet Distillery, and miles from anything else except sheep farms, was perfect for our two-night stay. The food served was typical Scottish hardy goodness, and they had dozens of whiskies to choose from. And we chose. Although the choices of where to tour were seemingly endless, we settled on 4 distilleries. The first, and one that has long been a personal favorite of mine, was nearby Glenlivet. We just managed to sneak in for the last tour of the day. If Ron and the Jack Daniels experience had managed to elevate my opinion of that distillery, the Glenlivet tour did quite the opposite. We were shown around the gleaming new expansion, built for £20 million in 2010, and wholly operated by two lonesome employees. The whisky they produced might still be great, but the corporate, antiseptic feel left a lot to be desired. However, we did get two small souvenir glasses, and they had to-go bottles for the driver to sample later (a smart touch that all the distilleries did to discourage drunk driving). The next morning we got up and out the door relatively early in order to get the first tour at Glenfarclas, one of the few large independent distilleries left in the Scotland. Again, a great tour guide makes all the difference, and we had a great one with Murray. And Murray, like with Ron a year before, clearly took great pride in his whisky. Near the end of the tour as we were being shown one of the cask warehouses, there was a “surprise” knock on the door, and one of the tasters, Tommy, was there for an “inspection.” He quickly knocked off a cork, filled a dirty glass with 24-year-old Glenfarclas whisky and handed it to me. “Um…can I…taste it?” I said, feeling the eyes of a dozen other tourists gazing at me. 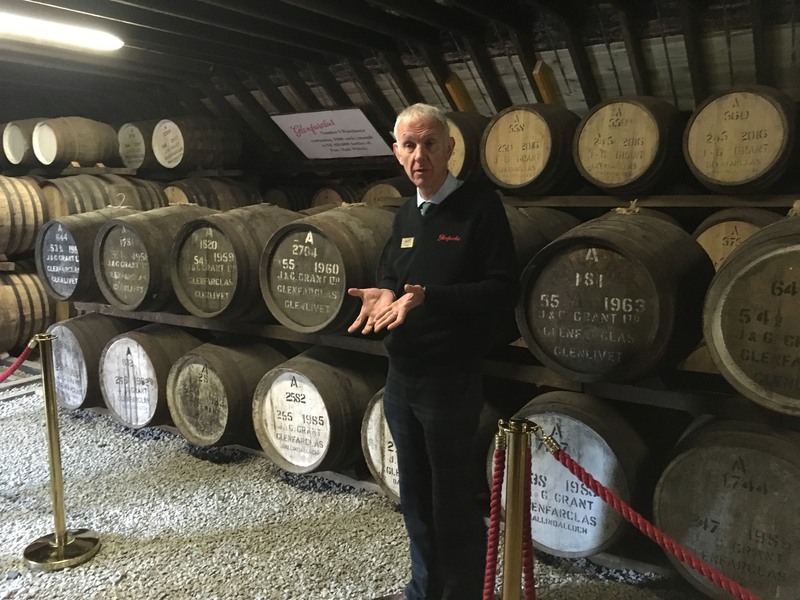 However, Glenfarclas could not answer my burning question about bourbon casks from a year before because they famously use sherry casks instead. But I was too busy enjoying the experience (and whisky) to care by the end of the tour. You’re a legend, Murray. Right up there with Ron. We made two more stops that day, to Benromach and Glen Moray distilleries, opting to just have a tasting, not a full tour with each. At the last stop, Glen Moray, we barely got in the door before closing, and there wasn’t time for a full tasting. But instead of turning us away, they poured out a few drams, allowing us to sample a small variety, and for free no less! The other distilleries had been evasive about answering my burning question from the previous year: where did you get the American oak casks from? Finally, Ron’s bold claim was validated here on the other side of the world, they were using oak casks from American bourbon distilleries, including Jack Daniels. There was something beautiful about it, really. 300 million years ago, the continents collided, forming the Appalachian chain in North America, and the Highlands of Scotland. Two centuries ago, Scottish and Irish immigrants moved to Kentucky and Tennessee, whose hills bear a striking resemblance to those of their homelands, and brought with them their knowledge and heritage of distilling whisky. And now, a great deal of whisky being made in Scotland is enhanced by the bourbon-soaked casks from those Scotch-Irish descendents. We might have visited more distilleries, but the weather had turned out unexpectedly beautiful. On a recommendation from Murray, we had lunch in the lovely and small village of Findhorn, right on the edge of an ocean inlet. We watched the tide roll out, took a short walk along the rocky beach, and then set back out on our way. Truth be told, I could have spent a great deal more time going from distillery to distillery, searching for the best scotch whisky. 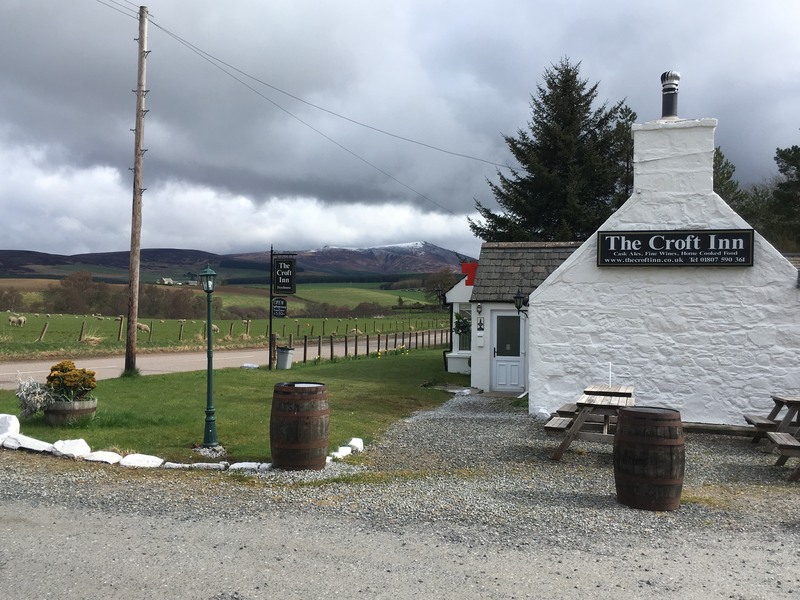 However, the long weekend was still a wee bit too short, and we started heading back south, spending a day in Cairngorms National Park, surrounded by snow-capped peaks, before continuing on back toward Edinburgh. I’ve never been so relieved to turn in a rental, happy to say I’ve driven on the other side of the road, but not excited to revisit the experience any time soon. Throughout the trip, the topic kept returning toward the next alcohol-inspired adventure. Surely this needed to be a yearly, slightly inebriated foursome. Spirits to lift our spirits. Would we stick with whisky? Setting our sights on Ireland? Kentucky? Another area of Scotland? Or would we enjoy wine in Italy or France? Or Spain? Or Germany? Or…or? Well, I guess that’s really a discussion for another day. Sometimes travel is enlightening. Sometimes it’s inspiring. Sometimes it’s an escape. And sometimes, it’s just a wonderful few days away with good food and drinks, and even better company. I would go back, stresses of driving and all, in a heartbeat.